It’s not uncommon for me to do pet portraits of dogs or cats, but I think this is the first wild animal portrait I’ve done. The fur was challenging but the eyes were the most fun. The native plants in the background are apricot mallow, a drought tolerant California native plant indigenous to high desert and chaparral areas, as well as valleys. This weekend is the Breeder’s Cup race at Del Mar Racetrack. 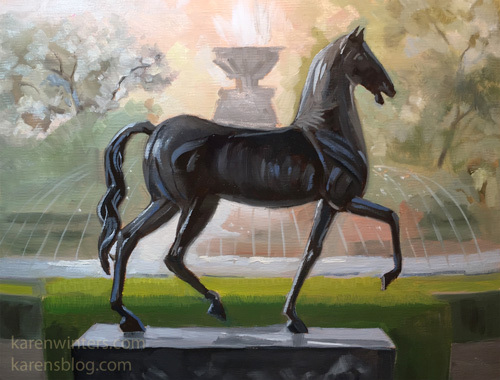 This painting is of a Breeder’s Cup statue at Santa Anita Racetrack, where the races were held in 2016. 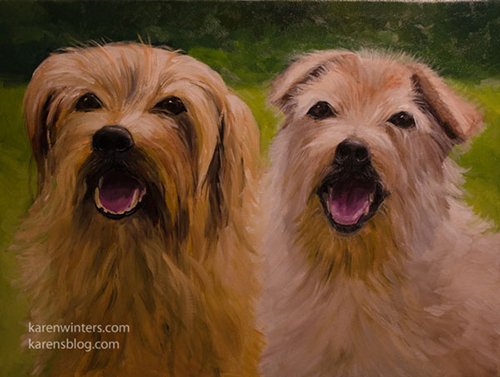 These adorable dogs were the subjects of a recent portrait commission for a long-time client and friend of mine. Her two dogs are getting up there in years, and she thought it was a good time to have their portraits done for posterity. Lucy, on the left, is the younger of the two. Jack, on the right, is eleven, I believe. Jack had already had his summer haircut, but Lucy had not. Now, there’s no way you can get two dogs to pose and hold a pose with the light on them “just so” … so every portrait begins with a photo session. That involves a fair amount of crawling around on the ground to shoot them from the right angle. My husband and I were shooting simultaneously, to maximize the number of reference photos we’d get before the dogs ran out of energy or patience with us. The next step was to edit the pictures in Photoshop to put together a composite where the light and direction of their gaze was consistent. After client approval of the reference composite, it just comes down to the painting, which was very enjoyable. If you’re interested in having a portrait done of your favorite pet, please write. 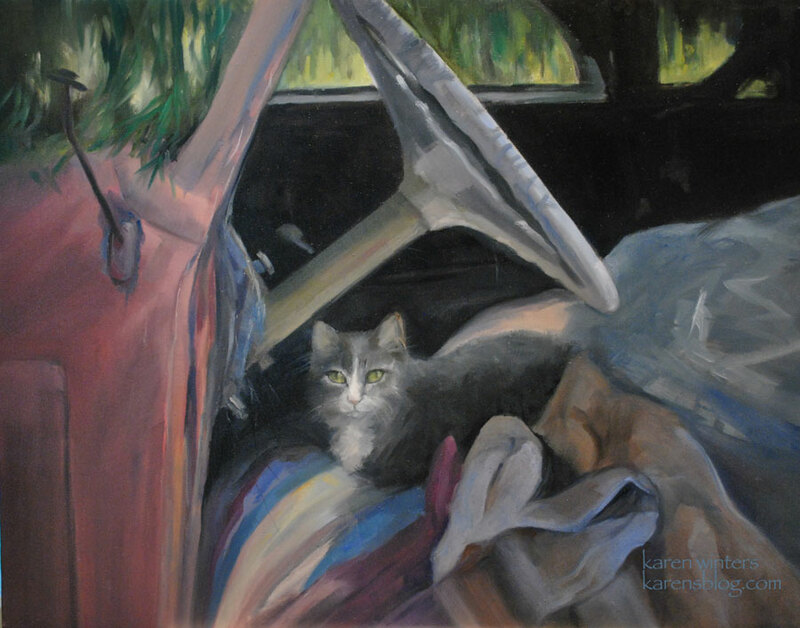 Interested in having a portrait of your pet? Please write. When we were in Arizona not too long ago, and visiting a beautiful lake, my attention was suddenly diverted from the sparkling water by the dazzling fur of this little dog, who was being treated to a walk. I asked the owners if I could take some pictures of her, and they happily agreed. I explained that I was an artist, always on the lookout for an interesting subject. 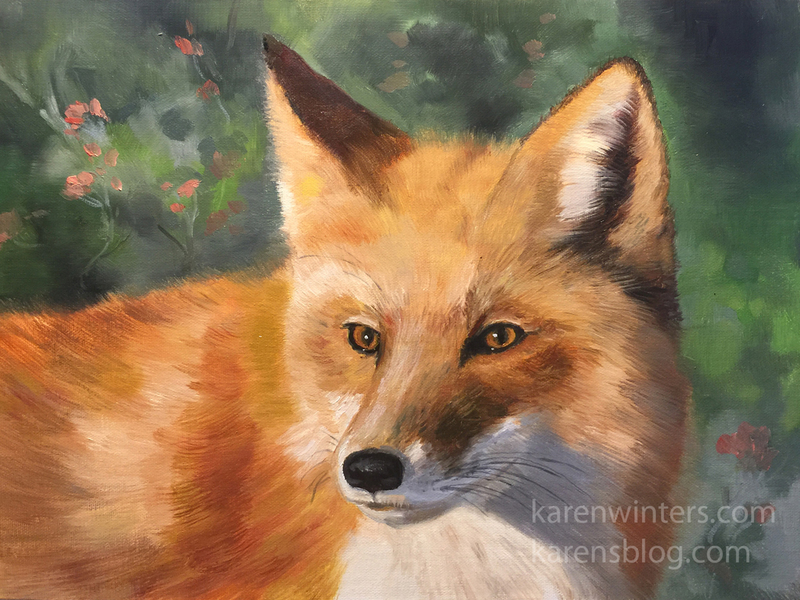 I almost always paint animals from photography (they aren’t the best at holding still) so I worked on this portrait when I got back home. 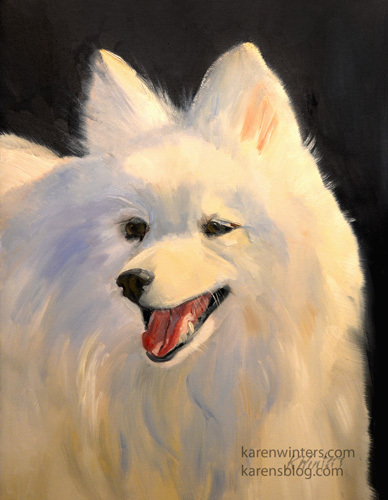 More than a year later the painting found a new home with the owners of a dog who looked identical to this one. The Arizona folks called it a Japanese Spitz dog, but it greatly resembles the American Eskimo dog, an AKA breed. 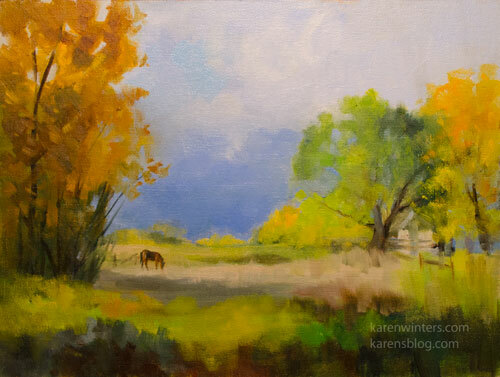 A horse grazes in a small pasture in Bishop, California, in the Owens Valley at the foot of the Sierra Nevada. The sunlight burns through the clouds surrounding the distant Sierra mountains. How time flies! I painted this portrait for a family last year, and because it was intended as a Christmas present I didn’t post it here on my blog, lest the secret be spoiled. Then time moved on and I forgot to mention it. So, I’m presenting it now as an example of an animal portrait – I’ll post the companion portrait of a collie in a few days. 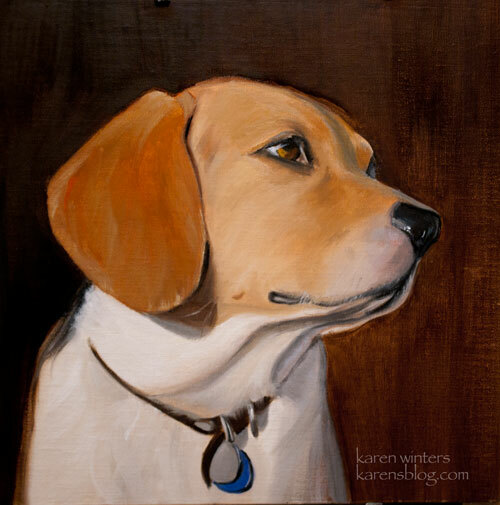 Portraits (of animals or people) make special, unforgettable holiday gifts. It’s a good time to place your order now, as things get busier and busier as the end of the year approaches. The client for this one lives in a different state from me, so I needed to work from a provided photo instead of taking one myself. But I loved the angle and pose, so I was quite happy to use it. 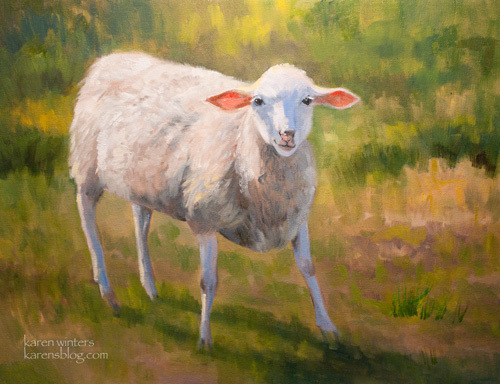 This sweet young sheep was painted from a photo I took last year at the San Luis Obispo Plein air festival. 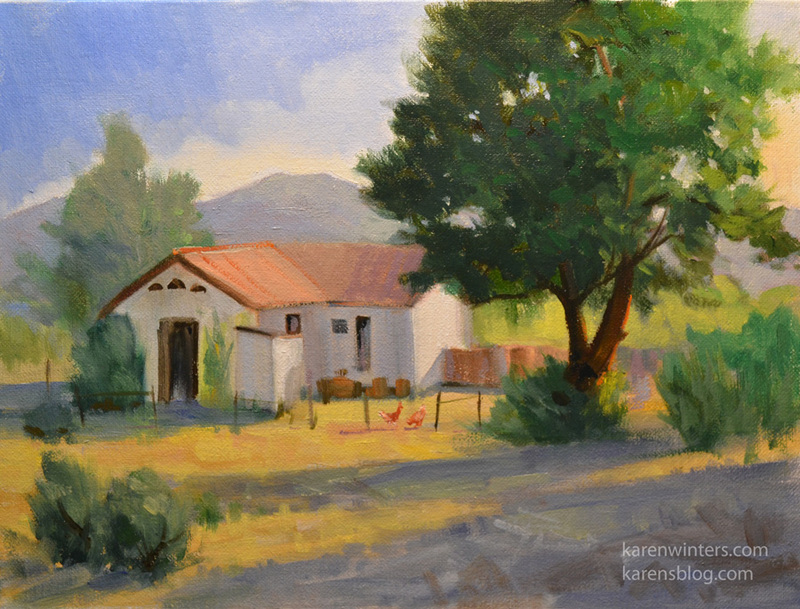 I was near the grounds of the Cal Poly SLO Cheda ranch, and the animals moved close to the area where I was already painting Bishop Peak. The sheep, I read from their website, are managed by students in the Cal Poly animal husbandry program. Several students were out monitoring the flock. I found it interesting that small birds were perched on the backs of many of the sheep, presumably helping themselves to insects in the fleece. It looked like a mutually beneficial relationship. This particular young sheep (a ewe, I’m guessing) was quietly munching and looked up at me with curiosity. 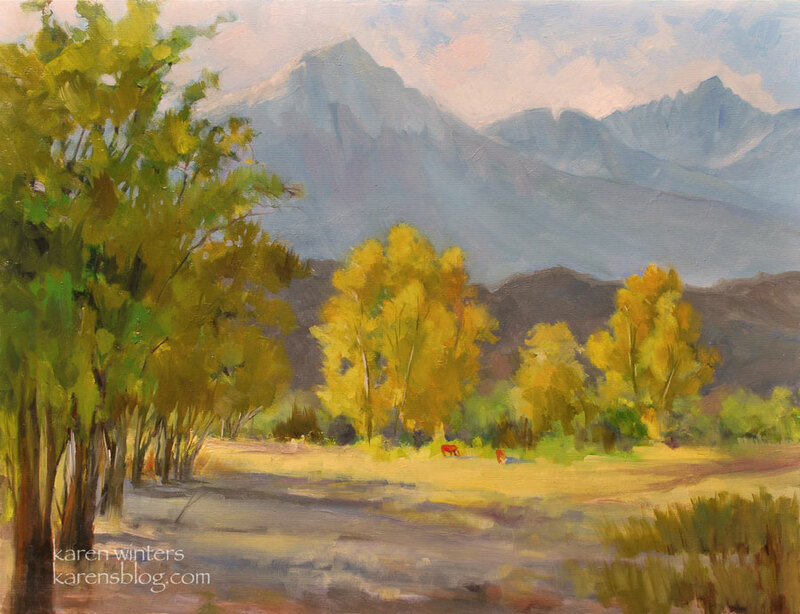 As fall approaches, my thoughts turn to the color of the eastern Sierra, one of my favorite places to paint. I’m hoping I’ll get away for more Sierra painting this year, but show commitments might prevent that. We’ll have to play it by ear. A few years ago, on our anniversary in March 2004, my husband and I were driving out to Malibu and came across a wonderful commercial nursery near Somis. It appeared that it was occasionally open to the public and, from what we could tell, was used for special events. We saw several lovely arbors and pergolas that seemed to be wedding bowers. As we were walking around the grounds, what caught my eye was an old derelict 53 Chevy pickup truck which a cat had made his home. He was proudly seated on some blankets or comforters and a pile of plastic bags and his lordly manner told us that he was the master of this domain. The lack of a door, windshield and windows didn’t bother him a bit. We didn’t disturb his rest and he gave us leave to take a few pictures and then, you know, suggested we move along. (I suppose the cat may have been a female, but I like the idea of calling him Tom.) The fact that there were blankets there led me to suspect that some kind human had done their part to give his bachelor pad a little creature comfort. I wish now that I had written down the name of the nursery, but a little map research leads me to believe that it may be the Hartley Botanica and recent photos indicate it has grown even more beautiful through the years. There was a large aviary which held peacocks at the time we visited, and I don’t know if it is still there. I would like to think that “Tom” probably had a good time watching those birds every now and then. It’s been 7 years and I don’t know how old he was, but I hope he’s still prowling around.